One of the features that sets the Evoz Wifi Baby Monitor apart from other baby monitors is our flexible alert system. Evoz alerts can help when you’re out to dinner but want to receive an SMS if the baby cries for more than ten minutes (without demanding that the babysitter put the baby down to contact you, because she’s clearly got her hands full!). Or when you want your partner to receive an email at work every time baby cries during the day, so when she comes home she has a pretty good idea what kind of a day you’ve had. Or when you want to know if baby’s room gets too cold at night, before the temperature wakes the baby up. We’ve got you covered! Crying Alerts alert you any time the baby cries for more than a specified amount of time. Evoz cry alerts are backed by our patented cry detection system, so you get an alert when your baby is actually crying, not just every time the dog barks! 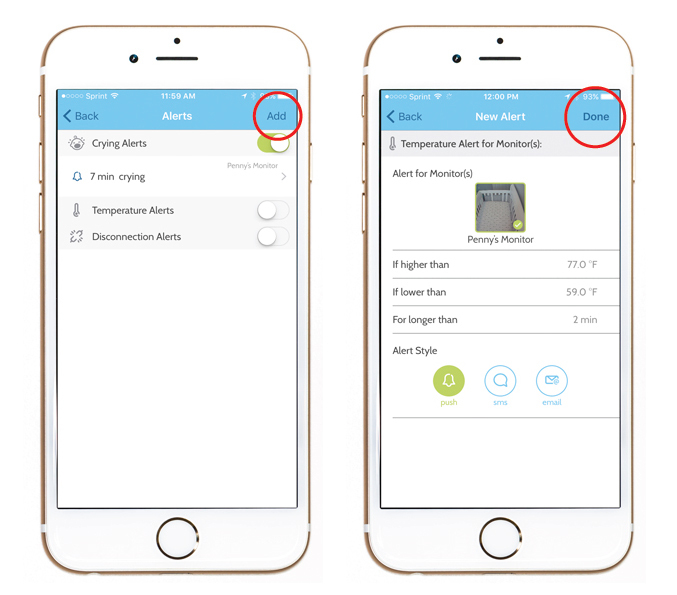 Temperature Alerts you if the room temperature gets too hot or too cold for longer than an amount of time you specify. Disconnection Alerts will alert you any time the Evoz server cannot connect to your monitor for more than five minutes. email alerts are sent by email. To see the Alerts screen, tap the Notices tab and then tap My Alerts. Here you’ll see a list of all the alerts you currently have set up, organized by category. Tap your monitor(s) to select and deselect them. Your new alert will apply only to the selected monitors (those outlined in green, with a green checkmark). 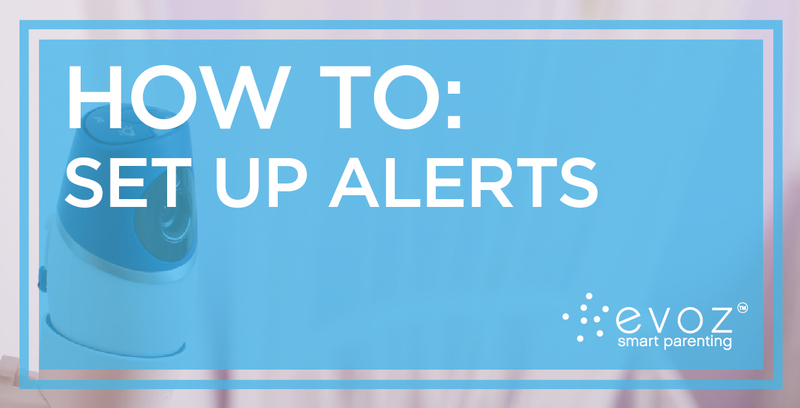 Set the options that apply to the alert type you’re setting up – for example, for temperature alerts, you can set an upper temperature limit, a lower temperature limit, and number of minutes after which you want to be notified. Tap the icons under Alert Style to select and deselect push, sms, or email alerts. For sms alerts, you’ll need to enter a phone number; for email alerts, an email address. Tap “Done” (iOS) or “Save” (Android) to add your new alert. 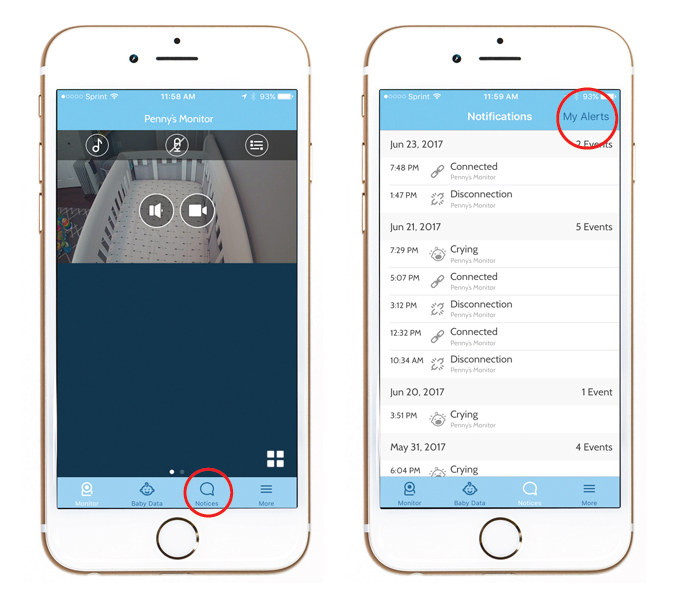 Note that you can add multiple alerts of the same type: for example, you might want a push notification every time the baby cries for more than one minute, and also an SMS notification to your neighbor’s phone for backup every time the baby cries for more than ten minutes, so she can lend a hand when you need one! You can pause Evoz alerts in several ways. To pause a single alert, tap on that alert to view the Alert Details screen, then tap the toggle switch next to Alert Activation. That alert will be greyed out on the Alerts screen; you can turn it back on any time. To pause one kind of notification for an alert, tap on that alert to view the Alert Details screen, then tap the toggle switch next to the type of notification you want to turn off. That notification type will be greyed out on the Alerts screen. To delete an alert entirely, tap on that alert to view the Alert Details screen, then tap Delete Alert (iOS) or the trash can icon (Android) to delete it. If you have any questions, feel free to email us any time at support@myevoz.com. And in case you don’t have one yet, the Evoz WiFi Baby Monitor is available on Amazon or on our website!